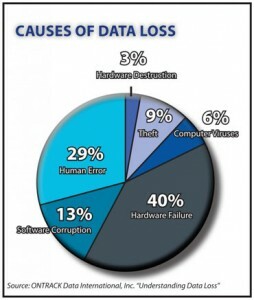 Data Management has several aspects: storage, organization, manipulation, and security. In order for a system to be able to manipulate the data that is entered, it must be organized and stored in a secure environment to be accessed whenever necessary. A very poorly maintained storage device or hard drive makes the management of data challenging and sometimes, impossible. PEAK Solutions uses the best preventive monitoring and maintenance to ensure the proper management of your valuable information. This includes antivirus protection, backup services, software implementation and hardware integration. By staying on top of the latest innovations in data management, PEAK has the knowledge and capability to give you the advantage of expert data management. What should you be backed up? While this will vary, business owners should identify critical data that needs to be backed up and archived, such as electronic files, spreadsheets, documents, email, databases, notes, pictures, graphics, applications and their settings, servers and other irreplaceable customer data. Full physical backups of data should be done at least weekly, and even more often if your business generates large amounts of new data daily. Incremental data backups can be done on a daily basis.